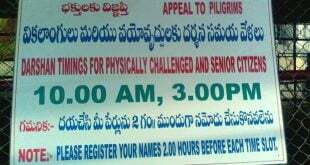 Senior citizens can avail this benefit by displaying the Age proof at Entrance Near Tirumala Nambi Temple which is beside Main Temple. 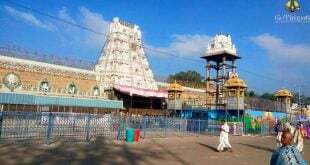 Senior Citizens are allowed for Darshan Daily in two schedules. Darshan Timings are 10 A.M and 3 P.M. Reporting Time at Senior Citizens Darshan Entrance 8 am and 1 pm. Senior Citizen age for Men is 65 and above, women it is 65 and above. 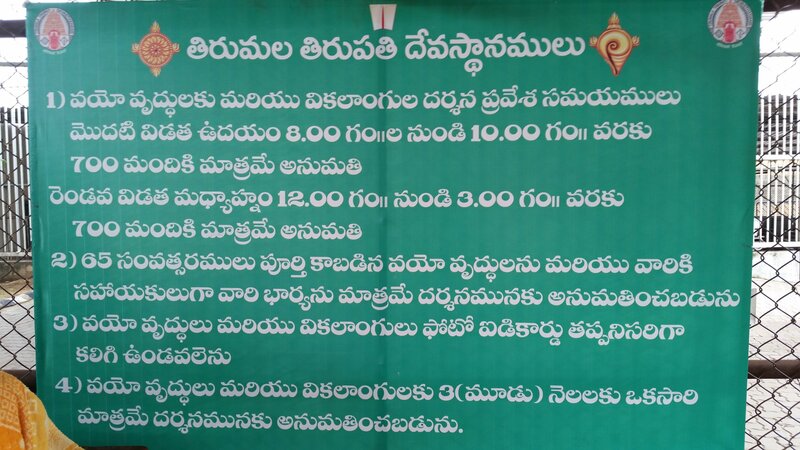 On Friday, Senior citizen Darshan will be in the afternoon only i.e 3 pm slot. 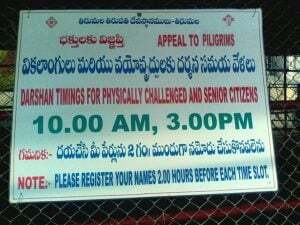 Only privileged person is allowed to queue, no friends and relatives are allowed along with devotee. Children under 12 years will be allowed with their grandparents with no extra ticket. 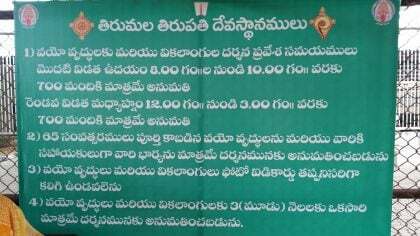 Morning 700 and Evening 700 devotees are allowed. For any other queries/ comments, please leave your comment below we will get back to you at the earliest. 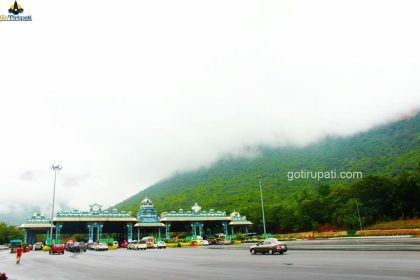 Can i accompany my father who is 78 yrs old and had trouble in walking. I am 35 yrs old. Yes you can accompany him for darshan . My age is 67. My wife’s age is 60 years and two months completed. 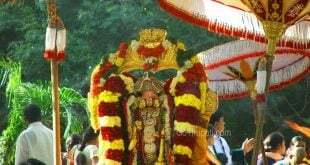 Whether she is also permitted to perform darshan along with me by availing Senior Citizen Darshan. Yes she can accompany with you. I am aged 60 years and 2 months [DOB: 15/12/1958]. My wife is aged 51 years [DOB:14/05/1967]. Whether my wife can accompany me in SENIOR CITIZENS SLOT. 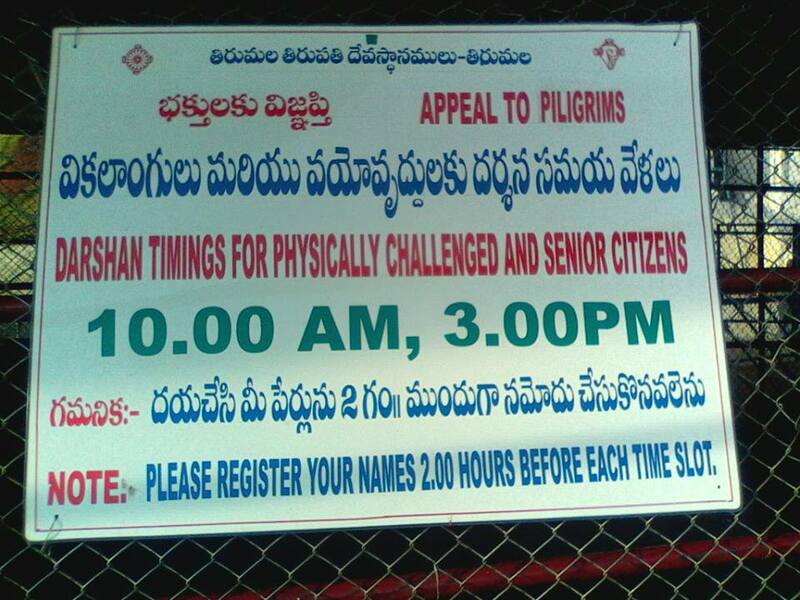 Only aged above 65+ are considered as senior citizens darshan. There is no such special for senior citizens .